(This article was originally published in Cichlid News Magazine, Jul-99 pp. 20-25, It is reproduced here with the permission of author Ad Konings and Aquatic promotions). During the fall of 1997 Dr. Jeff Taylor, editor of Cichlid News, asked me if I would be interested in speaking to cichlid clubs in Australia. What a question! John Reeves, the distributor of Cichlid News and other cichlid related products in the land "down under", had proposed such a trip which became a reality in February of this year, when I was privileged to speak in four different states over a span of four consecutive weekends. John organized the entire tour, and he and his wife Jann hosted me in their home in Melbourne. I had never been to Australia before, and the only person I had had contact with previously was Norm Halliwell, who had distributed Cichlid Press books in the early years. I was aware of a number of cichlid clubs in Australia, but had never seen any of their publications so really knew little about the cichlid hobby there. John managed to get three clubs to host "cichlid weekends" and he did the same for interested parties in Melbourne. After John picked me up at the airport in Melbourne in early February, he took me to Aquarium Industries, the largest importer of aquarium fishes in Australia; it didn't seem to bother him at all that my trip from el Paso to Melbourne had taken about 23 hours! At Aquarium Industries, we talked with Rick Datodi, the owner, who explained that the aquarium hobby in Australia is very much restricted by the number of available species that are allowed to be imported. Although I was generally aware of such restrictions, I was amazed by the incredibly short list of cichlid species that are currently permitted (see table). Australia and New Zealand have very strict importation and maintenance laws where aquarium fishes are concerned, which are ruled by an "allowable import" list and a "noxious" list. These are both positive lists, which means that only the species that appear on the allowable list can be imported, whereas species on the noxious list are forbidden to be kept. When a noxious species is collected in the wild in Australian waters, one is required by law to kill it, rather than re-release it alive. Heavy fines can be levied if this is not done. Apart from these lists, wholesalers are also faced with another unique law which stipulates that all fishes imported into the country must be kept in quarantine for at least two weeks (some, such as gouramies, require longer periods of isolation). This means that importers have to build two or even three fish houses: one for two-week quarantine; one for four-week (or more) quarantine; and one for holding fish after quarantine is completed, pending sale to retailers. Each quarantine area is off-limits to all except the owner and his immediate staff, and all waste waters must be sterilized before exiting the building! Needless to say such precautions substantially boost the prices of imported fishes. There is (or was) a system in place by which the aquarium industry could petition for the placement of novel species on the allowable list each year; a maximum of ten species could be applied for annually. During the past 15 years, Norm Halliwell has been the representative of the aquarium industry in these negotiations with the government. He has found it extremely difficult to convince both state and federal agencies that a number of species, e.g., Cyphotilapia frontosa and many other Rift Lake cichlids, can't "go wild" in Australian waters and begin devouring native species. As a result C. frontosa and others are not on the allowable list. Nevertheless, many of these species (which compose a so-called "grey list") are in fact available in Australia, based on bred stocks that were established prior to the strict importation procedures coming into effect in April, 1983. The flip-side of this coin is that a number of "non allowable" species have been lost due to (temporary) drops in popularity. The author and naturalist Heinz Staude (right) with muscular friend in a reptile park in Perth. The first weekend of my stay I was invited to speak in Sydney; John served as my host on all three trips away from Melbourne. The cichlid club in Sydney, or rather the state of New South Wales, is called the NSW Cichlid Society. The president, Bruce Moore, and his wife Marg hosted us for the extended weekend. John Smits, the club vice-president, did most of the driving. Our first visit was to Norm Halliwell's establishment, Riverside Aquarium. He is well known in Australia for his knowledge of cichlids and is the author of a book and many magazine articles on the subject. Only later did I become aware that Norm had been the driving force in representing the hobby in producing legislative procedures which eventually resulted in the listing of more than 200 species on the allowable importation list. Our meeting was scheduled for Saturday afternoon (Feb. 6), and it lasted until around 10 in the evening. It was held in a public school with room to seat about 170 hobbyists. Although I don't mind hot weather, others may have suffered a bit in the non-airconditioned room, as it was still "high summer" in Sydney. The ever-present barbecues (several of them) were in full swing outside the building (but no shrimp this time). Among the speakers of the day was David Eccles, who offered an interesting collection of anecdotes about the history of Lake Malawi and its cichlids. Between 1960 and 1979, David was employed as a fisheries officer by the government of Malawi. Charlie Wright's backyard Daphnia breeding tubs in Sydney, 1999. Photo by Ad Konings. On Sunday we made an extensive tour around town in a rented bus with Bret Williams (a club council member) as driver, visiting various aquarium shops and hobbyists. The most impressive of the lot was St. George Aquarium, which had several very large (2500 gallons and more) show tanks stocked with freshwater as well as marine fishes. They carried a remarkably large assortment (in view of the limited number of importable species) of cichlids. Another shop. TLC Aquarium, also had a rich collection of cichlids. During noon barbie-time, we visited Tony (the club treasurer) and Sabine Wilkins, who have a separate room in their home for their cichlids with several rows of completely decorated tanks connected to a central filter system for simple maintenance. Two easy chairs in front of a wall of aquariums for relaxed observation . . . now that's the way to enjoy your cichlids! Next we paid a visit to Charlie Wright, who had a shed in his garden whose walls were lined with racks of tanks. Although the shed was rather small (ca. 8' x 8'), the tanks were meticulously clean with all lines, ducts, etc. neatly organized. In order to feed his fishes live foods, Charlie grows Daphnia in small tubs outside in his garden. There are a total of 14 tubs, and Daphnia are collected from a single tub each day, allowing a colony a two-week recovery period between harvests. Evening barbie-time was spent with John Franken, the club's organizer of fish shows. After a day of sight-seeing in Sydney, John and I returned to Melbourne where we'd spend a day before departing for my speaking engagement in Perth on the west coast of the country. Perth is the capital of the state of West Australia and has about two-thirds of the state's population (1.2 million). The other 400,000 people live in an area which is about 3.5 times the size of Texas! The cichlid hobby has not made great inroads in Perth; instead, native fishes of Australia appear to be more common in aquarists' tanks. The guru of native species, Dr. Gerald Allen, lives and works in Perth. He still has an office in the Western Australian Museum where he was kind enough to lead a small group of us cichlid people around. In the past 20 years Dr. Allen and his team have collected and described an impressive number of fishes from Australian, New Guinean, and southeast Asian waters. and as a matter of fact, he had just returned from yet another expedition in a remote area of Malaysia. As a result, he was not prepared to speak at our convention, which was disappointing. Iain McGregor, president of the Perth Cichlid Society, at the Malawi pond in his garden. Photo by Ad Konings. From Melbourne, Heinz Staude joined John and me on the flight to Perth, because he too had been invited to speak at the convention. This was a very fortunate coincidence, because it turned out that Heinz is an "old pro" who knows an awful lot about Australian wildlife. We were greeted in Perth by Bill and Cynthia Freeman, our hosts for the coming six days. The day before our meetings began, we enjoyed a visit to Rottnest Island, about 12 miles offshore, which is the last refuge of the quokkas (tiny kangaroos that live in the bush). In other parts of Australia, these slowhopping little marsupials have been driven to the brink of extinction through predation by (among others) feral cats. The convention was held in the auditorium of Perth Zoo and was opened by Heinz speaking about his early experiences in the hobby. Heinz was born in Leipzig, Germany, where he had the most primitive fish tank you can imagine. He used a tractor tire tube to aerate the water and a Bunsen burner to heat it! He was able to flee East Germany and settle in Australia almost 40 years ago. He owns and operates a large aquarium store in Melbourne and has received a gold medal for having bred more than 300 different species of aquarium fishes. The second speaker was Brian Jones, who spoke on fish diseases and how to prevent them. Next was Denis Robinson who gave an interesting talk on his commercial hatchery which breeds Black Bream in Perth's harbor. The final presentation of the day was my own talk on Malawi cichlids. Ad Konings and Dr. Gerald Allen at the fish collection at the Western Australian Museum in Perth. Concurrent with the convention was a fish expo, also at the zoo. Here local hobbyists and aquarium shops had set up about fifty well-decorated tanks that attracted more than 500 viewers that weekend. The second day of the convention began with a talk by Barry Hutchins, the curator of fishes at the Western Australian Museum, who spoke about the problems with coral formations around Rottnest Island. Howard Gill of Murdoch University (Perth) then presented a talk on the native fishes of southwestern Australia . . . and I learned that not only lungfishes but also the tiny salamander fish (Lepidogalaxias salamandroides) survive in mud during periods of drought. After a presentation on beautiful sea slugs by Clay Bryce, also of the Western Australian Museum, I spoke about the cichlids of Lake Tanganyika. The days following the convention were spent traveling around Perth, led by George Barnes (president of the Perth Cichlid Society) and lain McGregor (vice-president), where we visited several cichlid hobbyists and aquarium stores. Due to import restrictions and the fact that Perth is the most isolated city in the world, the variety of cichlids available was not very large. I was therefore pleased to see how some aquarists had held on to species that they feared would be lost to the Australian hobby forever if they quit breeding them and allowed the stocks to die out. One such species was Pseudotropheus sp. "elongates chailosi"; Heinz quickly obtained juveniles to reintroduce them to the Melbourne area at the other end of Australia. lain quickly became known as the "walking encyclopedia" as he knew virtually everything about the wildlife around us. While walking in the bush you could point something out, and (be it bird, plant, reptile, etc.) he would know its name and its natural history, truly amazing! Back in Melbourne, John and I had only one day for recovery before departing for Brisbane, the capital of Queensland. We were welcomed there by Bill Smith, treasurer of the Queensland Cichlid Group and owner of Smith's Aquarium, a well-appointed shop. Bill and his wife Sue were our hosts for our stay. The first night there was (you guessed it) a barbecue at the Smiths' and many club members were invited. Bill treated us to barbecued shrimp (the giant variety), mutton, been, chicken, emu (very good), camel, and crocodile . . . and I tried them all! The evening concluded with an informal, open air talk on Malawi cichlids. The talks on Saturday were billed as "a dinner and cichlids" and were held at the Nudgee College in the evening. Presenters were Ray Leggett, the well-known author of books on native Australian fishes, speaking on Costa Rican wildlife, and myself on Tanganyika cichlids. During the following three days, John and I were driven around by Bill and Greg Ure to see some hobbyists' set-ups, as well as the nature around Brisbane. In the city I saw the most advanced cichlid rooms on my entire trip; the variety of cichlids viewed was also the best I had seen. Almost all the places we visited had central filtration systems which dramatically reduce the time spent in cleaning and changing water. I also visited breeders who had Enantiopus melanogenys, Xenotilapia ochrogenys, Gnathochromis permaxillaris, and Ophthalmotilapia heterodonta. For readers in Europe and the U.S., this might not sound very exciting, but for Australia with its incredibly strict import laws, it certainly is. The hobbyists we visited all had between 20 and 40 tanks of various sizes. Bill also took us to Lamington Park where the most beautiful array of parrots, rosellas, and bowerbirds ate directly from our hands. Australia is really blessed with the most colorful birds that I have ever seen, and they're everywhere you look, including John's backyard. All tanks in Mark Roberts' fishroom are connected to a central filtration system. Photo by Ad Konings. Back in Melbourne John needed some time to organize the final convention, so I was fortunate that Heinz and his wife Renate took me to Phillip Island, renown for its populations of koalas and penguins. The one-day convention in Melbourne began with Heinz repeating his Perth talk, followed by Rick Datodi, who gave an overview of the current state of importing aquarium fishes into Australia. My talk on Malawi cichlids was followed by Norm Halliwell's explanation of how legislation had cut into the availability of cichlid species, with a listing of those species that had, as a result, disappeared from the hobby in Australia. After my second talk, Neil Armstrong showed us state of the art photography of native Australian fishes. Aquarium clubs all over the world should profit from his knowledge and stunning photography; there is no better way to promote the hobby than to show (potential) aquarists the fishes at their best. 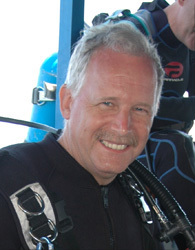 Neil is a celebrated member of ANGFA (Australia New Guinea Fishes Association). The president of that organization, Dr. Bruce Hansen, also flew down from Brisbane to attend the convention. My last Sunday in Australia was spent (you guessed it) around the BBQ in John and Jann's backyard. Norm Halliwell and Heinz Staude were there as well as the president of the Victoria Cichlid Society, Aussie Magnussen, who is a very motivated Aulonocara breeder. In conclusion I can say that the keeping of cichlids is very much alive in Australia, and that hobbyists there have the technology and expertise to breed even the most difficult species . . . once they can lay their hands on them. I wish to thank John Reeves and everyone else who was involved in the Australia'99 tour. It was a great success, and I would do it all again, fair dinkum! Konings, Ad. (August 04, 2000). "Australia'1999". Cichlid Room Companion. Retrieved on April 21, 2019, from: https://www.cichlidae.com/article.php?id=142.